Article from Daily Mail mentions Brimstone and has a great pic of Guy with his scruffy beard in preparation for his role as The Reverand. 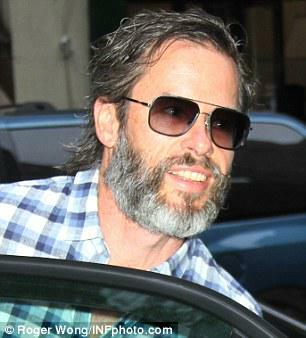 He is usually known for his clean cut looks, but Guy Pearce is embracing a much more scruffier appearance of late. This week the actor has taken the unshaven look to a whole new level, stepping out in New York with a longer beard. Wearing a plaid white and navy shirt, Pearce's salt and pepper facial hair was on full display outside of the Today Studios on Wednesday. Pearce, who is known for his roles in films such as Memento, The Adventures of Priscilla, Queen of the Desert and locally for his part in the soap Neighbours, channeled a look previously seen on him in The Rover. In the 2014 film The Rover, which also stars Robert Pattinson, the beard helped to portray a former soldier Eric, whose car is stolen by a group of young kids. Set in the outback and directed by David Michod, his character is dangerous and eventually gets revenge on the gang by tracking them down. Next month, filming begins for Pearce's next work, Brimstone, co-starring Game of Thrones actress, Carice Van Houten. In the thriller, he will play The Reverend, perhaps a character that requires the bearded look if the poster is anything to go by. He will again partner on screen with Robert Pattinson, who has signed on for the film.